Pan-seared, Alaskan Salmon with forbidden black rice. Our chefs have come up with a dish we’re sure you’ll like. 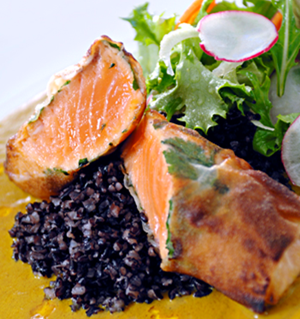 They’ve created a pan-seared Alaskan Salmon; sweet, with a hint of spice, served with forbidden black rice, crisp seasonal greens and savory pickled fennel. A creamy curry sauce with just a hint of chili oil finishes the dish.&nbsp; It’s got just enough heat to make the flavors really sing. Ready to give it a try? Just let your server know you received this email. As always, thank you for being our guest.&nbsp; We look forward to seeing you. *Offer available August 19th through August 28, 2011. Dine in only, dinner only. This email was sent because you joined our Eclub in one of our restaurants, online or at one of our events. Your email address will not be shared with anyone. You can take your name out of our Eclub at any time by clicking the unsubscribe link on this email and you will be removed from our list immediately. Restaurants Unlimited Inc., 1818 N. Northlake Way Seattle, WA 98103. To ensure delivery, add Kincaids@Kincaids.fbmta.com to your address book.